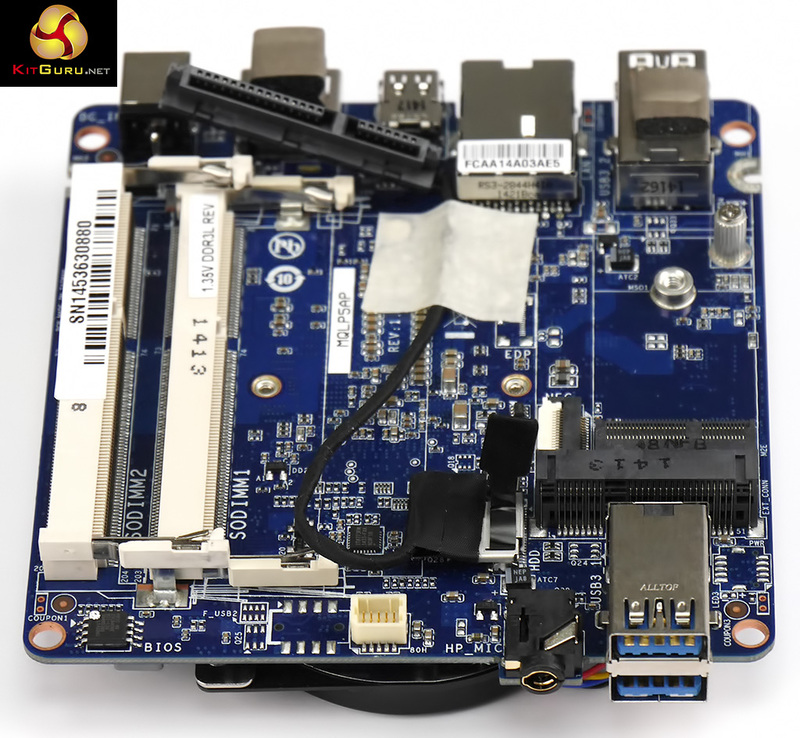 There are three models in the range of BRIX S Mini-PC barebones that use the new Broadwell-U processor. These offer a choice of 5-series Core -3, -5 or -7. These are all dual core processors with Hyper Threading so while it sounds like a big difference these three models are only separated by clock speed. You can see the range over HERE. 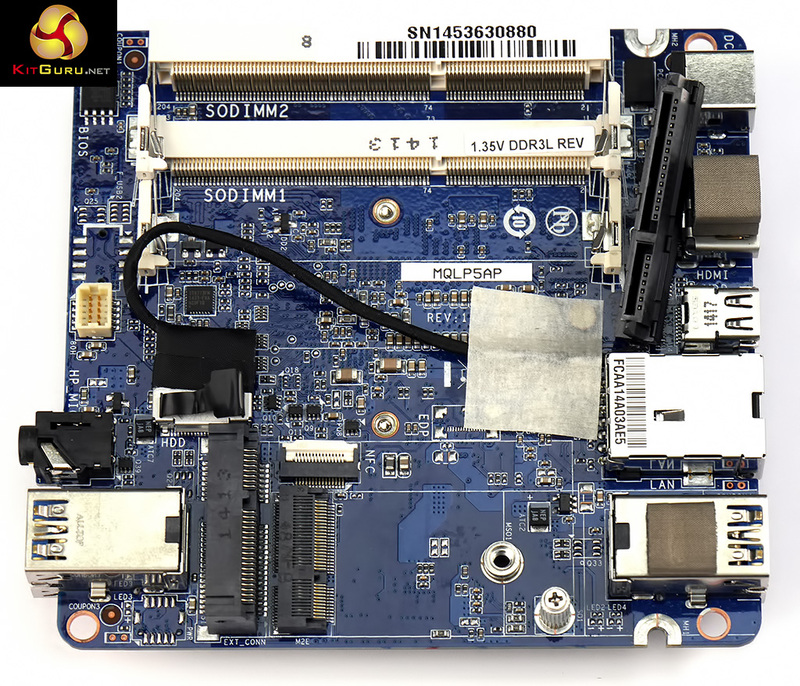 The set of features shared between the models includes Intel HD Graphics 5500, USB 3.0, mSATA, 802.11ac and VESA 75mm/100mm mounts. Watch via our VIMEO Channel (below), or over on Youtube HERE. BRIX S are barebones systems so you need to supply RAM, an Operating System and storage. 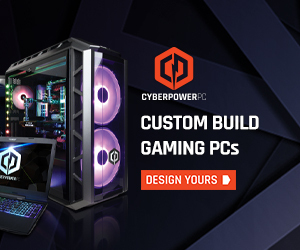 RAM is easy as the system takes DDR3L SO-DIMMS and Gigabyte gives driver support for Windows 7, Windows 8 and 8.1, so realistically you will use Windows 8.1. 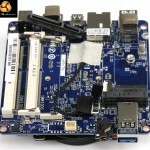 Storage presents you with a choice as the motherboard has an on-board slot for mSATA however Gigabyte also includes a conventional SATA connector and a 2.5-inch drive bay. 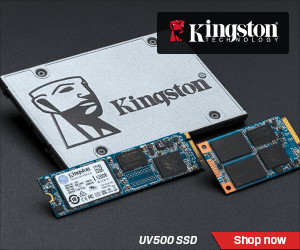 This means you can use a conventional SSD – realistically a 2.5-inch hard drive would be a poor choice. 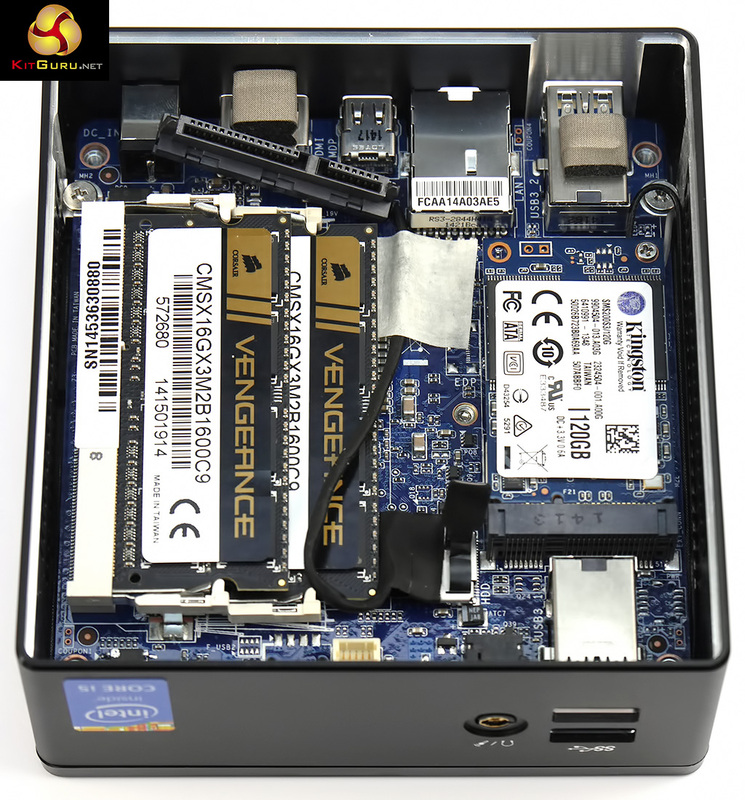 The inclusion of a drive bay distinguishes BRIX S from Intel NUC (which looks very similar) and there is another less obvious difference. The most recent version of NUC uses a Core i5-4250U that has a 15W TDP and the active cooler is clearly audible and somewhat annoying. 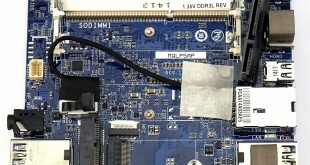 By contrast the cooling fan on this Core i5-5200U is practically silent, despite the fact that it has the same 15W TDP. 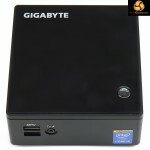 Clearly Gigabyte has chosen the cooler wisely and this makes a significant difference to the experience for the user. 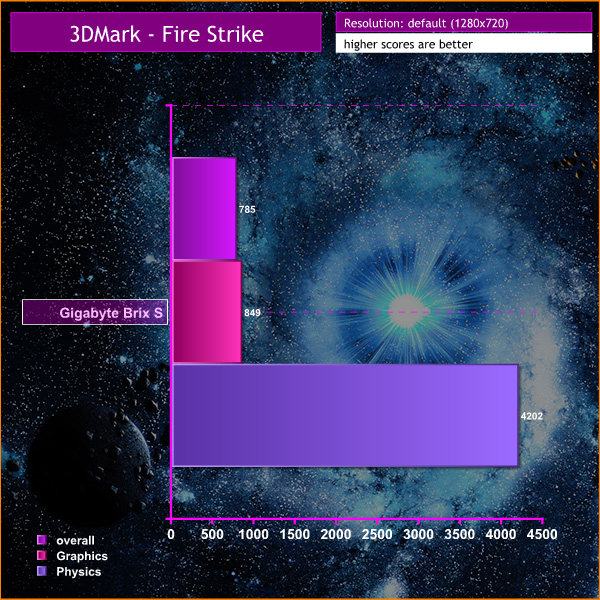 Our benchmarks results in PC Mark 8, 3D Mark and MediaEspresso 6.7 show the BRIX S is a decent little PC that has relatively weak graphics. 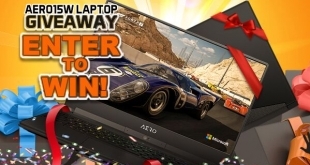 By the standards of previous Intel silicon the HD Graphics 5500 part of the chip is excellent and the drivers works as well as any we have seen from Intel. On the other hand, while the BRIX S can manage the Cloud Gate test is 3D Mark with reasonable results, although it falls off a cliff in Fire Strike. The graphics are competent but fall short of the ability to play ‘proper’ games. This latest Intel GPU core employs 24 Unified Shaders that run up to 900MHz. Converting a 3.3GB MKV movie file to MP4 using MediaEspresso took 13 minutes which is much faster than we expected from such a tiny, low power PC. At idle the BRIX S draws 10W which rises to 32W under heavy load. In general use you’ll see a figure around 25W during typical office duties. You can feel the casing of the BRIX S gets warm when the system is running however it is barely above ambient temperature and a trivial matter. Get close to the BRIX S – that’s really, really close, within a centimetre or two – and you can hear the fan however, despite its reported 2,450rpm spin speed it is effectively silent. Under constant CPU load in MediaEspresso the fan became audible but still very quiet. 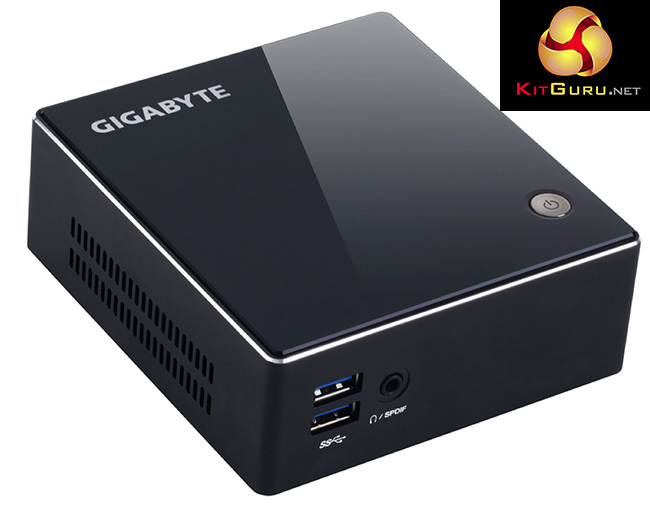 Gigabyte has priced the BRIX S at a level that matches the Intel NUC, however the 5th Broadwell-U is a significant step forward. 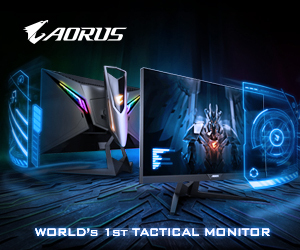 You get decent PC performance, albeit with graphics that lack the grunt to play games, yet the power draw and noise levels are tiny. If you are looking for a tiny PC that can perform day-to-day duties you need look no further. No availability in the UK as yet, but we have been told the retail price for our Gigabyte Brix S review unit will be £310 inc vat. Power draw never rises above 32W at the main plug. 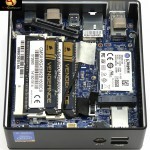 Gigabyte includes a 2.5-inch drive bay as well as mSATA. 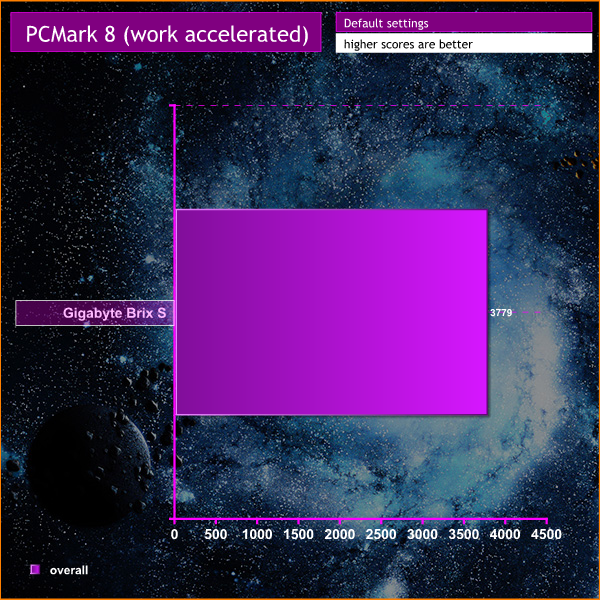 Broadwell-U CPU and GPU pack a decent punch. 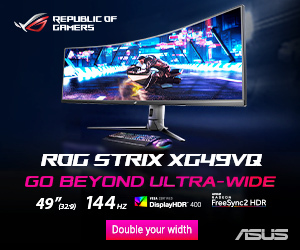 Intel graphics drivers make HDMI connection a cinch. 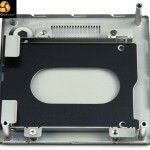 VESA mounts for tidy installation. 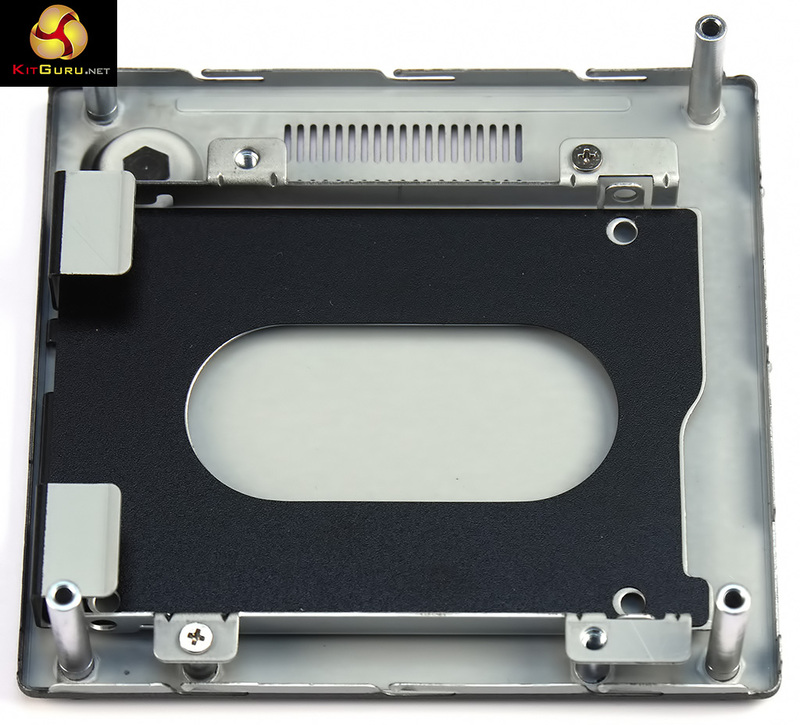 Drivers are supplied on optical disc rather than USB media. Graphics aren’t up to the task of playing games. 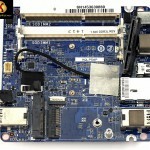 It feels wrong to spend £500-600 building a tiny Windows PC. 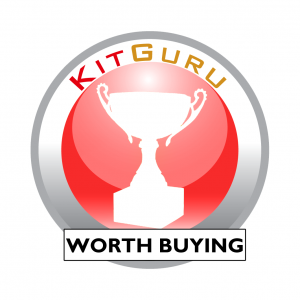 KitGuru says: This first outing for Broadwell-U is a triumph for Gigabyte and the BRIX S.